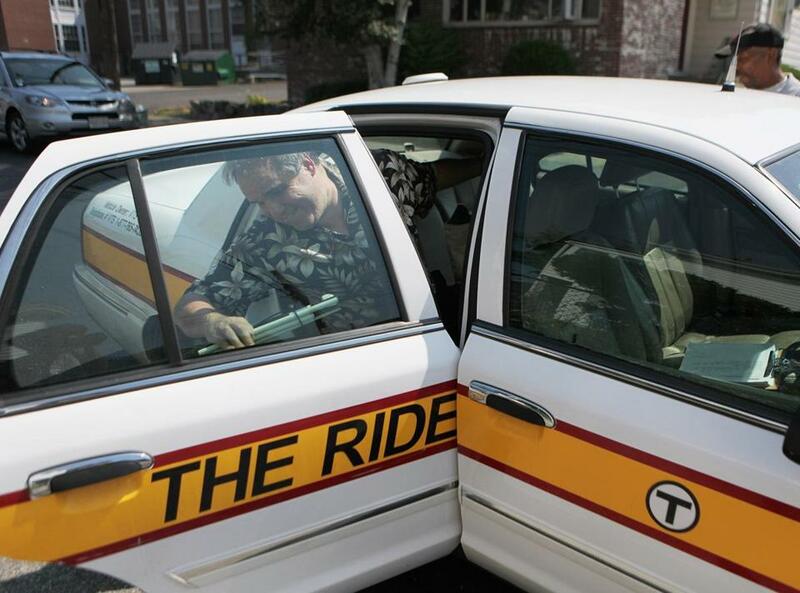 A passenger leaves a vehicle used by the MBTA’s The Ride service. A move by the MBTA to crack down on fraud in The Ride, the transit service for the disabled and elderly, has led to a sharp drop in the number of older users, according to figures kept by the transportation authority. Nearly two years ago, the Massachusetts Bay Transportation Authority began to require that all applicants for The Ride attend an in-person evaluation at a Charlestown office, rather than mailing a lengthy application and a doctor’s note. 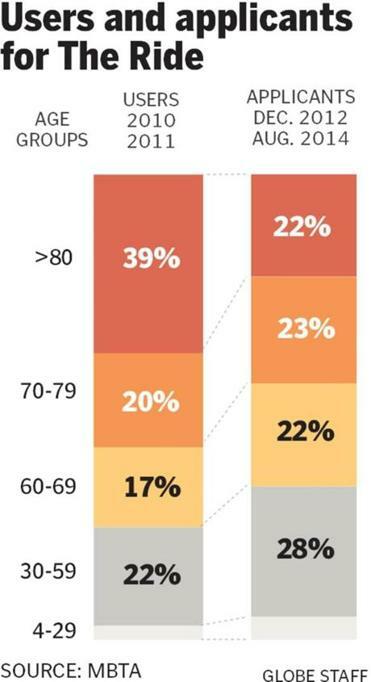 Since the interview requirement began, only 22 percent of applicants have come from the oldest age brackets. In 2010 and 2011, before the change, people over the age of 80 accounted for 39 percent of Ride users, according to numbers kept by the MBTA. The interviews are part of an effort to crack down on misuse, a major concern for a transportation service that is heavily subsidized; the T estimates that each trip on The Ride costs the agency $45. Users pay $3 for a trip, which takes them to and from any destination that is within three-quarters of a mile from a train or bus stop. More than 2.1 million trips were taken on The Ride between July 2013 and June 2014. Still, for people like John Mageary of Lynn, The Ride was a convenient way to get around. Mageary, who died last month at the age of 92, had grown accustomed to taking frequent short trips to dialysis appointments using The Ride, among the only outings he could do without his family. Then, in May, Mageary was informed that he needed to renew his Ride certification. And unlike in the past, he would need to attend an interview in Charlestown. Mageary’s family argued that he should not need to make the journey, which would be arduous for someone who needed frequent bathroom breaks, struggled on long car rides, and found new places and faces overwhelming. But the T’s response, according to his family, was clear: no exceptions, not even for a 92-year-old. Berger said he believed the interview is also meant to scare off applicants; his uncle died without ever renewing his eligibility. “It’s obvious that they’re trying to discourage people from using the service,” Berger added. He called for an age-based exemption for the screening interviews, but T staff say that would violate the Americans with Disabilities Act. In-person interviews for paratransit have become standard at almost every major US transportation agency. The trip to the evaluation is free; applicants may bring a companion. The interviews are not simply meant to weed outmisuse, Lambert said. They are also an opportunity for people to learn about the service and find out about other transportation resources, such as free hospital shuttles, he said. Applicants also learn about accommodations on the T’s fixed-route system — buses equipped with wheelchair lifts, newly installed train station elevators — that could help them travel solo. By the end of this year, the T will offer free bus and subway passes to all Ride users. Pushing customers to use fixed-route transportation saves the agency money, but Lambert said it is also good for customers: People who learn to comfortably use buses and subways can reach their destinations faster and more cheaply. Some applicants expect the interview to be an interrogation: Instead, customers are met in the lobby and brought to cheerful offices, answer questions about their abilities and routine, complete a balance test, then proceed through a half-mile course featuring uneven pavement, a ramp, and a small set of stairs. People are rarely rejected. From February to June, monthly rates of interviewees deemed ineligible ranged from 0 to 6 percent. Yet advocates who work with seniors say many find the process daunting, fearing a bewildering government building, incomprehensible questions, or a fatiguing obstacle course. Concerns have been compounded by the T’s increasing use of “conditional acceptances,” which encourage customers to use The Ride only in certain situations; for example, if there is a 50 percent chance of rain or snow in coming days, if they are traveling to an unfamiliar place, or if there are physical barriers in the path to a bus or T station. “It creates all these if and when, and how scenarios that leave people feeling confused,” Villers said. The paper application system was not without problems. It could take weeks or months to receive a response. An application with a mistake could result in a wrongful rejection. Now, the average wait for a postinterview decision can be as short as two days. Karen Schneiderman, senior advocacy specialist at the Boston Center for Independent Living, said the T should consider establishing other interview sites. “It would be nice if somebody 85 years old didn’t have to go to a building that was 35 or 40 miles away,” Schneiderman said. Martine Powers can be reached at martine.powers@globe.com or on Twitter @martinepowers.